Sealaska Heritage Institute (SHI) is teaming with a world travel company to document on video how to harvest and prepare spruce roots and do spruce-root weaving, an ancient Northwest Coast art practice that is considered to be endangered. The company, Lindblad Expeditions, reached out to SHI and offered to donate its production services to make the video, which will feature master Haida weaver and teacher Delores Churchill. The team will aim to document each step of the process through Churchill, who, at age 90, is credited with helping to revitalize the art form across the region. Her contributions in the field are considered to be so significant that the artist-in-residence space at Sealaska Heritage in 2015 was named in her honor. SHI President Rosita Worl said she was overwhelmed by the generosity of Lindblad Expeditions. “Through this video, current and future generations of weaving students will be able to learn the art form from a master. We are worried about losing this art tradition, and this gift by Lindblad Expeditions has eased our fears, as the process will be documented on video and made available to students through our archives,” Worl said. “The LEX-NG Artisan Fund is a mission-based initiative, engaging at the nexus where artisan development, conservation, and expedition travel meet. We are delighted to be able to provide the resources to document this important art form, “added Stacy Rivett, Director of Artisan Development at Lindblad Expeditions. The idea of documenting each step of an ancient art practice can be fraught with tension, as artisans worry the information will fall into the hands of unscrupulous pirates of intellectual property who will mass produce pieces and pawn them off as “Native” art. However, in this case, Lindblad Expeditions agreed that SHI would hold the copyright to the footage. “This is a gift. Lindblad Expeditions is giving back to the cultures to which their clients are exposed, and we could not be more grateful,” Worl said. Lindblad Expeditions operates marine-based expeditions around the world in partnership with the National Geographic Society. Lindblad Expeditions, through its Artisan Fund, will videotape spruce-root weaving processes during SHI’s spruce-root mentor-apprenticeship with Churchill in 2018. The mentor-apprenticeship program was funded by the Lindblad Expeditions-National Geographic Fund (LEX-NG). The goals of the apprenticeship are to ensure that endangered, advanced spruce-root weaving techniques and associated cultural knowledge and protocols are passed on to future generations, and to build cohorts of weavers. Another program at SHI that teaches about spruce-root weaving includes its Latseen Northwest Coast Art and Leadership Academy, through which nearly 40 students will visit the institute’s building this month to study a collection of exquisite baskets donated by sisters Stephanie Cady, Patricia Maxwell and Michelle Campbell, originally from Hoonah, in June. 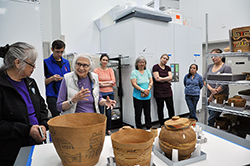 The family donated the collection, which includes baskets and bottles with spruce-root weavings, in memory of their brother, Hugh Dean Daniels III, who recently passed away. Lindblad Expeditions is an expedition travel company that works in partnership with National Geographic on its ship-based voyages to inspire people to explore and care about the planet. The organizations work in tandem to produce innovative marine expedition programs and to promote conservation and sustainable tourism around the world. The partnership’s educationally oriented voyages allow guests to interact with and learn from leading scientists, naturalists and researchers while discovering stunning natural environments, above and below the sea, through state-of-the-art exploration tools. CONTACT: Amy Fletcher, SHI Media and Publications Director, 907.586.9116m, amy.fletcher@sealaska.com; Patty Disken-Cahill, 212-261-9081, pattydc@expeditions.com. Caption: Master weaver Delores Churchill (in white vest) examining spruce-root baskets at the Alaska State Museum with weaving students in 2017. Photo by Davina Cole, courtesy of Sealaska Heritage Institute.